Parking a moving truck is tough. Add in a busy city street and it can turn the best Move Day into a nightmare. Follow our tips below to avoid the headache. 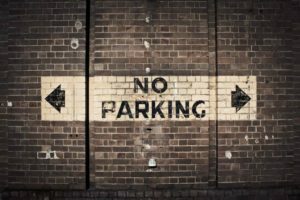 Can you reserve parking near your building? Is street parking available in front of your building? Many cities require parking permits for moving trucks. This can vary depending neighborhood, time of day, and day of the week, so check out your local regulations before your next job. Cities like Chicago, New York, Los Angeles, Dallas, Boston and San Francisco even post this information online. Time of Day Restrictions: These are areas that only allow parking during certain hours. Make sure to let you customer know if you need to move the truck. Street Cleaning: These blocks need to be clear during certain hours each week. Clear out before the streets get cleaned up. Time Limits: These spots limit the amount of time you can stay parked. Make sure to move the truck before time expires. Sometimes legal parking isn’t available anywhere on your customer’s street. Have your crew unload their supplies at the start of the job and then park the truck at the closest legal spot. Once your crew is ready to load-up, bring the truck back and be ready to move as soon as possible. Most major cities have an app or two to help you navigate street parking. Check out the downloadable apps for your city and find the one that works best for you.